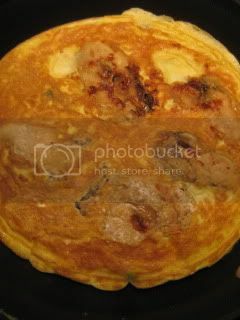 I made Oyster Omelette. 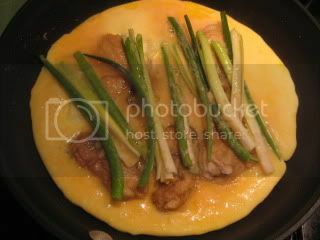 I originally wanted to make it with my donabe skillet, Iga-yaki Toban, but the volume I was going to make was too big for Toban. So I used a regular frying pan, instead. Next time, I will make a smaller size in Toban...because Toban would cook to the core really nicely and give more fuller tasting experience. 1. First, to clean the oysters, toss 5 large oysters in some salt by hand and rinse them in running water. 2. In a small bowl, marinade the cleaned oysters in 1T each soy sauce and sake for 10 minutes. Drain the liquid and pat-dried the oysters. 3. 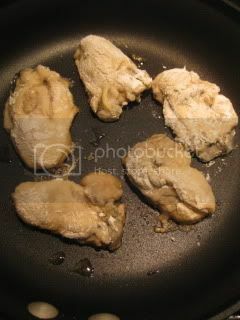 Dust the oysters in katakuriko (potato starch) and sear them in sesame oil in a pan over medium-heat for a couple of minutes. Turn them over. 4. Cut 2 scallions into half lengthwise and further cut in half crosswise. 5. Dust the scallions in flour and dip them in egg batter (4 eggs, beaten with a pinch of salt). 6. Arrange the scallions over the oysters and pour the beaten eggs over them. 7. Turn down the heat to medium-low and cook until the eggs are no longer runny. 8. Turn it over and cook for 1 more minute. 9. Transfer to a plate. Slice to serve. 10. 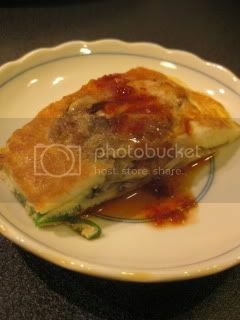 Serve with a sauce (1/2T soy sauce, 1/2T rice vinegar, 1/2tsp sesame oil, and 1/2tsp doubanjiang (hot bean paste). Oysters were so juicy...wonderful appetizer.